The United States Mint’s bullion 2010 American Silver Eagles posted their best May and second best sales month in history, according to the most recent figures available from the Mint. In just the one month, buyers purchased an astonishing 3,636,500 of the one ounce .999 fine silver coins. This number smashes the old May record of 1,904,500 set last year. May 2010 sales fell short of the best month ever by only 59,500. December 1986 retains the title with 3,696,000. While the month to month comparison is always valid, it should be noted that December 1986 bullion eagle numbers were lifted by the excitement of their premiering worldwide release just days earlier. Last month’s performance is also of note because it reflects an increase in bullion demand. April Silver Eagle sales dropped 873,500 over what they had been in March. Then again, March figures were sizzling too and contributed to define first quarterly sales as the highest ever at 9,023,500. 2010 now includes three of the five best months ever for eagle coins, already firmly holding the third best annual sales at 15,167,500 — and that with only five months completed this year. 2008’s second best annual level of 19,583,500 is easily within reach, but last year’s record of almost 29 million is still in the distance. With such enormous demand in place, it appears more and more likely that the Mint could cancel this year’s collector proof and uncirculated Silver Eagles as happened in 2009. Facing record interest in the bullion coins leaves the Mint little opportunity to build an inventory of silver blanks that it could use for collector strikes. 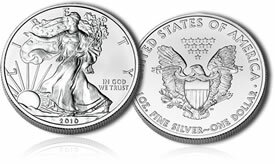 American Eagle bullion coins were authorized by Congress in 1985 to "provide investors with a convenient and cost effective way to add a small amount of physical platinum, gold, or silver to their investment portfolios." The Mint does not offer bullion American Eagles directly to the public but instead to a small group of authorized purchasers who in turn resell the coins to investors, dealers and collectors. I’m not surprised that US Silver Eagle sales continue to climb. They are gorgeous, they make an interesting noise when you clink a pile of 10 or so onto your desk – I love the sound of hard money in the morning – and we all know where the dollar is going. Although they are a great inflation hedge, I am buying Silver Eagles more as a survival hedge: when the dollar is gone, and the economy is gone, and even the grocery stores are gone (this will all happen around spring-summer 2012, when a certain Middle Eastern Black Swan takes flight), you local flinty-eyed farmer at a green market will not accept paper oblongs with portraits of dead presidents ; he’ll tell you to take them back to your shack and use as wallpaper. Just one Silver Eagle, though, will get you a nice armload of groceries.